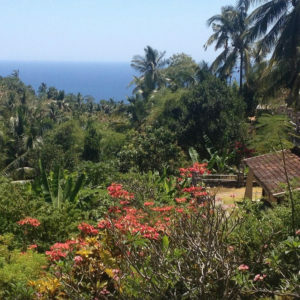 Join Tim Oddie and Anna Loughrey on a yoga and mindfulness retreat at the stunning, award-winning Gaia Oasis Abasan (mountain resort) in Tejakula, Bali. 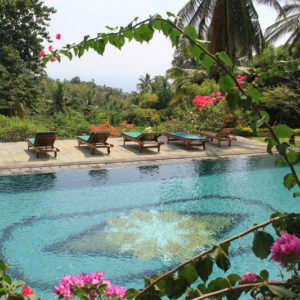 If you have not yet been to one of these retreats then look forward to arriving at a green sanctuary nestled in the hillside on the north coast, interwoven within the local culture and well away from mainstream tourist developments. 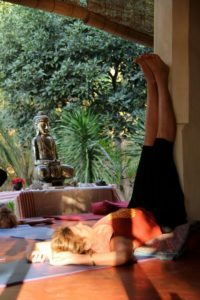 We are sure that you will discover that Gaia Oasis is the perfect location to experience the meaningful and restorative retreat that you so need. 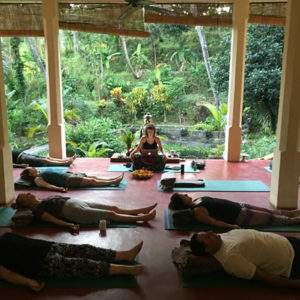 Let Anna and Tim guide you on an amazing journey using meditation and yoga. 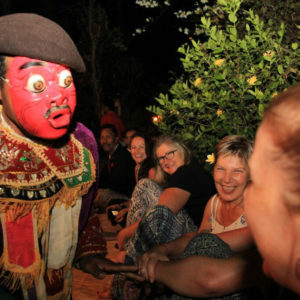 Meet like-minded people from all walks of life, all wrapped up in the beautiful surrounds of Gaia Oasis. 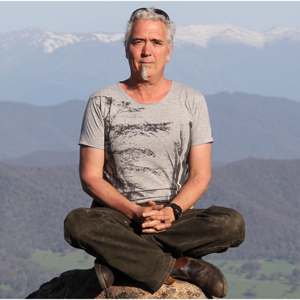 Tim Oddie – Yoga Teacher, is a highly regarded and internationally certified Iyengar Yoga teacher, Senior teacher registered with Yoga Australia and Director of Geelong City Yoga, With over 20 years of teaching experience, Tim is renowned for his extensive knowledge, warmth and humour. 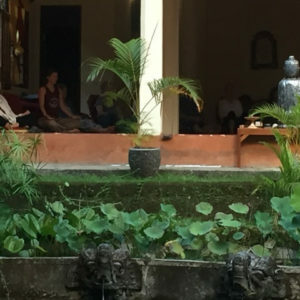 Anna Loughrey – Mindfulness Facilitator, brings many years of personal and professional investigation into supporting individual and community well-being. Drawing on her skills Anna helps create an inspiring environment and transformative experience for guests. Tim Oddie teaches with precision and clarity. 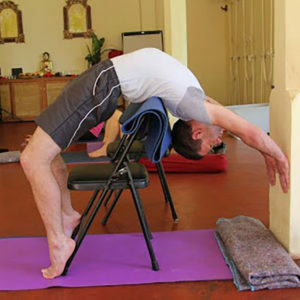 Tim is able to cater to all levels of Yoga practitioner. His classes are challenging and joyful. After a week you will feel uplifted and indeed renewed. Each day begins with a mindfulness practice. 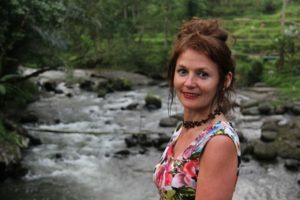 Anna will utilise a number of different techniques for inspiring greater connection to yourself and the world around you. 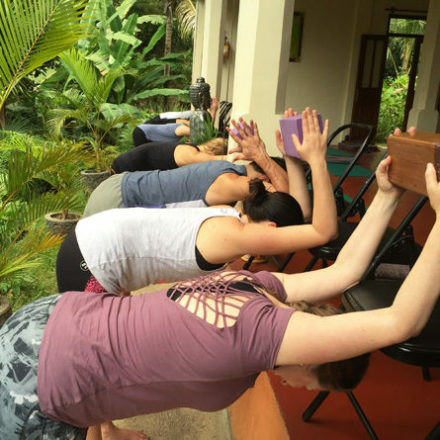 You will find this practice of sensitivity to what is happening within and around you, permeating your yoga, your week at Gaia Oasis and your life beyond. Home to small village of farmers, numerous chickens, ducks etc. 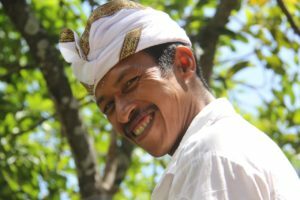 * Gaia Foundation funds local community development projects including coral reef rebuilding, sponsoring conservation education, establishment of Tejakula’s first municipal waste disposal system, provision of school uniforms, lunches and scholarships for local children, cultural programs for local children and more. 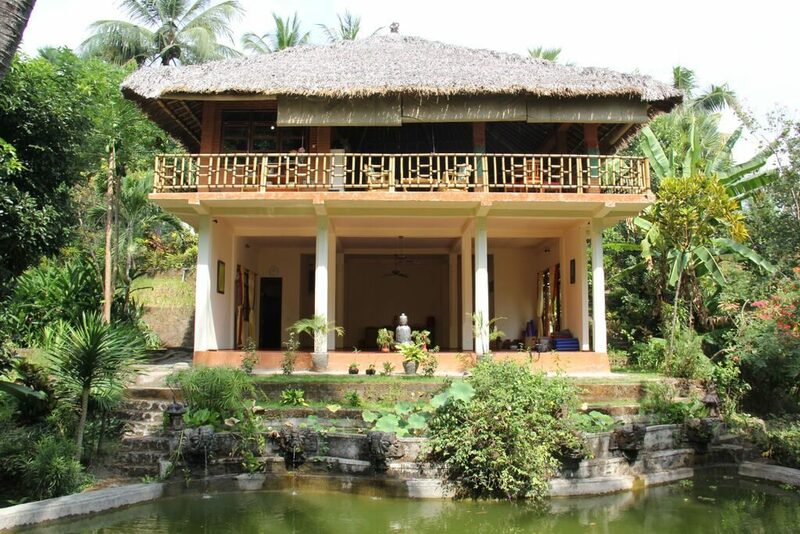 Your accommodation is in traditional Balinese cottages. 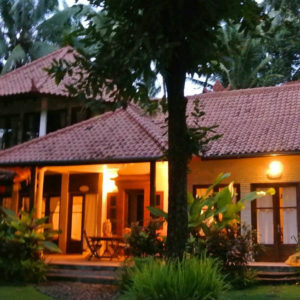 All rooms are set apart and connected via a series of peaceful walking paths. 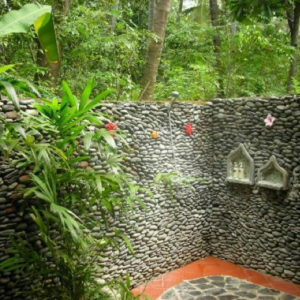 Rooms include: open air shower (hot and cold water); pedestal fan; tea and coffee making facilities; small fridge; and personal safe. As part of your all-inclusive retreat package, you’ll enjoy healthy cuisine that is eclectic, absolutely delicious and designed with care for your nutritional needs. At least one meal per day will include a chicken or seafood option. Wherever possible food is sourced from the surrounding gardens. Most of what is offered is gluten and refined-sugar free, with the odd treat to tempt you. Purified water, coffee and organic herbal teas are in endless supply and delicious afternoon tea is also supplied daily – you will not go hungry! Other food sensitivities or allergies can easily be catered for. The only things you will need to pay for are additional drinks such as smoothies, non-alcoholic cocktails and café lattes. Beer is available however we ask that alcohol consumption be kept to a minimum during the retreat. There is a large salt water pool for lap swimmers and sun lovers. For walks on black sand beaches, swimming and snorkelling – the ocean is a 5 minute drive in a courtesy shuttle. Complimentary with your retreat is a ‘Rain Forest Dream’ spa treatment in the beautiful Abasan Rainforest Spa Centre; this lasts for 2.5 hours! 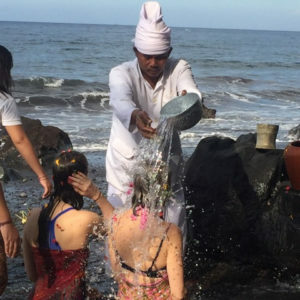 If you would like to book for additional treatments you can select from a diverse menu of other beauty and health treatments – inspired by the local environment, the herbal traditions of Bali,of India and of the West. Jetstar, Virgin, Garuda and Air Asia are the most common carriers. It is worth considering that with the budget airlines there is more chance of delays and flight cancelations than the others. It is essential you take out travel insurance as some hospitals will not treat foreigners unless they are covered. This should also cover you for cancellation costs caused by things out of your’s or our control. On the Sunday your retreat begins, you have the option of booking on board one of our two courtesy shuttles. The first leaves Legian at 9am from the Kusnadi Hotel (approximately 20 minutes from the airport) and another leaves Ubud at 10am from the carpark of Museum Puri Lukisan. At approximately 11.30am the shuttles rendezvous for a beautiful buffet lunch at ‘Organic Sari’ restaurant in Mt. Babur. 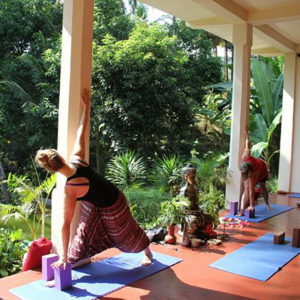 On Saturday afternoon following your final morning yoga session and then lunch a fleet of courtesy cars will be available for you to book travelling to Legian, Ubud or Denpassar airport. In the case of an emergency, there is a phone at Gaia Oasis that can be used to make or receive calls. Tim and Anna also have operational local and international mobile phones. In the interests of minimising digital distraction wifi in the common areas is only available during specific times of the day. If needed outside these times access can be arranged in the office. If bringing your mobile phone ensure data roaming is disabled to prevent excessively high costs on your return. Make sure your passport is valid for at least 6 months. Early this year Australia was listed as exempt from paying for an entry visa into Indonesia. You will be granted a free 30 day tourist visa upon entry. All airlines departing Indonesia are required to include airport departure tax in the price of your ticket. 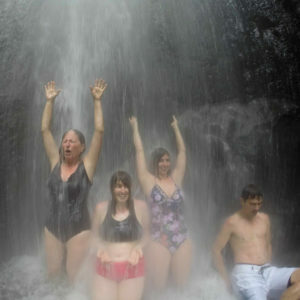 You will need minimal money whilst at Gaia Oasis Resort. Any extras, spas, smoothies etc. can be paid for by credit card at the end of the retreat. ATMs are readily available in Bali, including Tejakula ‘village’ 5-10 minute shuttle drive from the resort. Non slip sandals, yoga clothes, two sarongs if possible (for ceremonies), bathers, sunscreen, sun hat, favouite ‘out-fit’ for festive final dinner, light umbrella or rain coat, mosquito repellent (tropical strength), personal medical supplies including paracetamol, anti itch such as ‘SOOV’, antiseptic, band-aids (note Tim and Anna will have an extensive medical kit), small pocket torch, water bottle. Good walking shoes (if interested in hiking), googles (for lap swimming), mask (for snorkelling), antihistamines, local currency (to purchase souvenirs), credit card (to pay for spa treatments and additional activities on offer as you choose). * Please note cost does not include airfares or taxes.